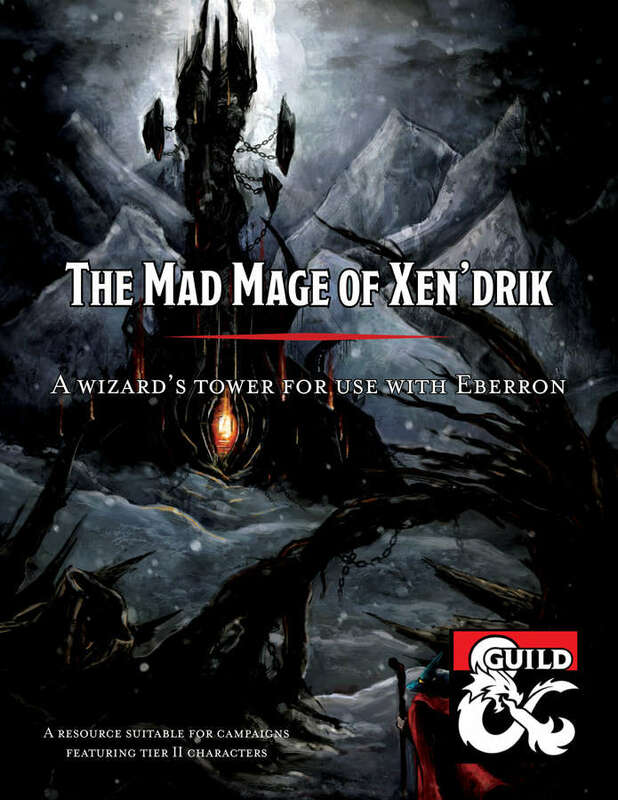 Deep in the jungles of Xen’drik, embedded in the side of a mountain stands the tower of the Mad Mage Xeffon. Though his various servants can be found flowing in and out of the tower on a daily basis, the elusive wizard has not been seen in many years. Some say he no longer lives, while others postulate that he is locked up in his laboratory, tinkering with magics that could alter the face of Eberron! This eighteen page adventure is in an eight level wizards tower with seventeen rooms. It is the usual drivil that one comes to expect of the D&D marketplace, bereft of value. I guess I deserve it for looking outside the Adept box. Imagine my surprise in buying an adventure and finding this tasty tidbit: “This is not an adventure. It’s barely a supplement. Really, it is a toolkit which I built to use on my stream and I am sharing now with you.” Then why is it in the adventure section? Why isn’t it in the “fluff supplement” section? Because it won’t sell as well? Because people won’t mistakenly buy it then? Regardless of Bryce puffery, it IS an adventure. Travis, it appears, thinks he needs a plot to have an adventure. Adventure Location is fine, and most times tacking on a fetch quest plot makes the thing worse instead of better. The map is garbage. I had to blow it up to twice normal size to make it even partially legible. Maps are not art, they are play aids. They can be pretty, but not at the expense of legibility. Screwy number fonts and a greyscale map that’s too tiny to read/use/interpret does not help the DM run the adventure. The blurb mentions “flowing inside and out of the tower” which implies an outdoor portion, but that’s not there. This is JUST a description of the towers eight floors. The only view in to the area around the tower is the picture of it on the map. There IS no surrounding context. It’s just eight levels of a tower. Not even a description of the outside of the tower. Barely a supplement indeed! The rooms, proper, are boring and disorganized. A neat barracks room stuffed full of lizard-people. Well-kept rooms with beds made and personal items in footlockers … is that how you picture a kobold lair? I recall making a similar complaint in some official WOTC drow barracks. Either make the kobolds kobold like or put in humans. You dilute the meaning of kobold when they are used as a substitute for human foes. Oh, you were just building an encounter and wanted something of the appropriate hit die? That’s a terrible idea and also explains why this adventure is so generic and bland. There’s almost nothing wizard-like in this tower. It’s all boring blandness. And what there is is described in a manner that makes you fall asleep. Not evocative writing at all. There’s no burning passion behind wanting to run this, based on the writing. A very basic example is the first floor. The description goes: “This floor is used as the latrine for every inhabitant of the tower, including the ogres. The sewage covers the entire floor, roughly four feet deep. There is a potpourri odor thanks to a minor illusion on the area, but it barely penetrates the sewage stench. The room is dimly lit due to several dancing lights throughout the area.” Note the first sentence. It explains the floor, providing justification for what follows. It’s not needed, at least not as the first sentence. Far more important are the next three. The floor is flooded, it smells, and there are lights. THAT’S what the party is looking to know right off the bat, and therefore what the DM needs immediately. This is a great example because it’s easily understood and a terrible example because it IS just one sentence. Transitioning though, to room seven as an example, yields more fruit. Paragraph one: you see light and here’s a bunch of mechanics. Paragraph two, there are are some big rocks in a circle and here’s some mechanics. Paragraph three, there’s three monsters in the room and here’s some mechanics. The DM needs to read three paragraphs in order to present the room to the party the first time. No. A well written room allow the DM to glance down and in half a second relate the room to the party. There are a heavenly host of other issues. Treasure is abstracted away, destroying yet more wonder to the game. The history of rooms are in their descriptions sometimes, providing nothing but padding. Just another adventure by someone who doesn’t know how to write an adventure. I always applaud people’s effort to publish, I just wish they took more time to understand how to do it instead of leaving it to the rest of us to pick up the $2 bag. This is $2 at DMSGuild. The preview is six pages and shows you the first ten or so rooms. That’s a good preview, doing what a preview should do, letting you know in advance of what you are buying. Check out Floor one and room seven for the examples I provided of misorganized text. (said with tong in cheek) This has some nice artwork. Reading what Mike Mearls says, that is the most important part and you did not even mention it. (See this twitter rant: https://twitter.com/mikemearls/status/1078393482618712064) Plus, thanks for doing an Eberron adventure review. Art is definately of equal importance as the writing…in a comic book.